Tim Kovach: Could climate change actually increase winter mortality? Could climate change actually increase winter mortality? If you already thought that the impacts of climate change were incredibly complicated and, often, downright confusing, I’ve got bad news for you – things just got even more complex. For years, researchers focusing on climate change concluded that increases in heat-related mortality would, by and large, be accompanied by decreasing cold-related mortality. As winter temperatures warm – which they have at an extremely fast rate – the health risk posed by extreme cold is assumed to decrease in a nearly inverse proportion. In its Fourth Assessment Report (AR4), for instance, the IPCC highlighted research that projected cold weather deaths would decrease by 25.3% in the United Kingdom from the 1990s to the 2050s. An extensive literature attests to the fact that changes in daily temperature influence health outcomes at the local levels and that [excess winter deaths] are influenced by temperature. However, our data suggest that year-to-year variation in EWDs is no longer explained by the year-to-year variation in winter temperature: winter temperatures now contribute little to the yearly variation in excess winter mortality so that milder winters resulting from climate change are unlikely to offer a winter health dividend. In order to explore the potential effects of climate change on winter mortality rates, the authors analyzed the factors which contributed the number of excess winter deaths (EWDs) in the UK from 1951-2011. They found that, across this entire span, housing quality, heating costs, the number of cold winter days, and influenza accounted for 77% of variation in annual EWDs. [W]e show unequivocally that the correlation between the number of cold winter days per year and EWDs, which was strong until the mid 1970s, no longer exists. But, the authors don’t stop here. They continue by explaining that climate records actually suggest that “winter temperature volatility has increased in the UK over the past 20 years,” despite global warming. As I discussed in a previous post on heat-related mortality, the ability of people to acclimate to local weather patterns is a key determinant in temperature-related mortality rates. The nefarious effects on EWDs could be substantial, with especially the vulnerable being caught off-guard by abrupt changes in temperature. Due to this increasing volatility in winter temperatures, population growth, and the continued graying of populations (people aged 65 and over are far more susceptible to influenza), it’s entirely possible that global warming could actually increase cold weather mortality rates. A similar study from fall 2012 (paywall), also published in Nature Climate Change, lends further credence to this research. The article examined the influence of climate change on mortality rates from extreme temperatures in Stockholm; the authors compared mortality rates from 1900-1929 to those from 1980-2009. The study, which examined changes in mortality rates from both extreme cold and extreme heat, found increases in both phenomena. The number of extreme cold events increased to 251 in 1980-2009 from 220 during 1900-1929. This change led to an additional 75 deaths. 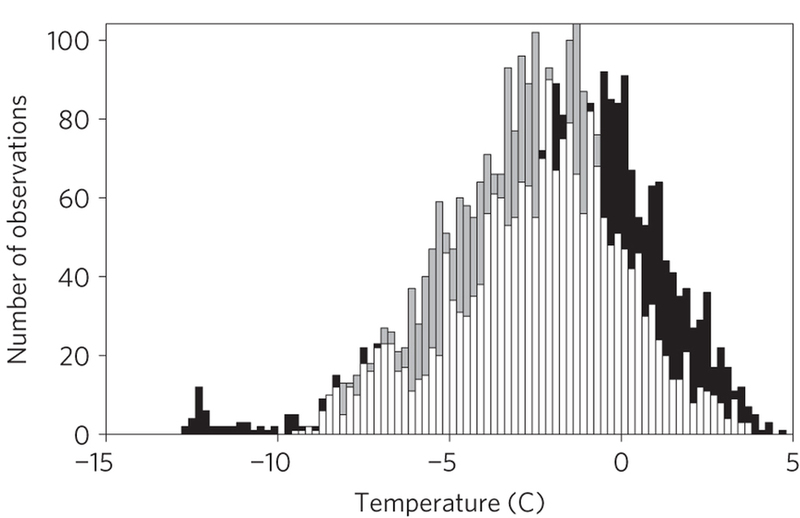 The stable and constant mortality impact of cold and heat over the past three decades, independent of the number of extreme events, shows the difficulties in adapting to changing temperatures…Future changes in the frequency and intensity of heat waves might be of a magnitude large enough to overwhelm the ability of individuals and communities to adapt. The expected increase in the number of elderly and other potentially vulnerable groups, in absolute numbers and as a proportion of the population, could make the impact of temperature extremes on human health even more severe. And just when you thought it couldn’t get any more complicated, it can. Two studies published in 2009, one focusing on Swedenand one focusing on Italy (paywall), established an inverse relationship between weather-related mortality rates in the winter months and mortality rates during the following summer. Low-mortality winters may inflate the pool of the elderly susceptible population at risk for dying from high temperature the following summer. So, to all of the climate deniers or “skeptics” who claim that global warming will somehow be beneficial – I’m looking at you, Congresswoman Blackburn – please take note: climate scientists keep discovering new ways that life is going to get drastically worse, unless we act now to slash carbon emissions and prepare for the warming that’s already locked in. Tim Kovach is a GEP alum (May 2013). He has helped manage and contribute to the Livelihoods Volume of the Post-Conflict Peacebuilding and Natural Resource Management project at the Environmental Law Institute and completed a report on the national security implications of climate change for the British government in 2012. He received his BA in political science and history from Baldwin-Wallace College in Berea, Ohio. He currently lives in Cleveland, where he manages volunteers and sustainability initiatives for the 2014 Gay Games. Categories: Uncategorized | Tags: Climate Change, Global Environmental Politics, Tim Kovach | Permalink.